Easter is tomorrow, so for many of us that means our fridge is filled with hard boiled eggs in brightly colored dye. 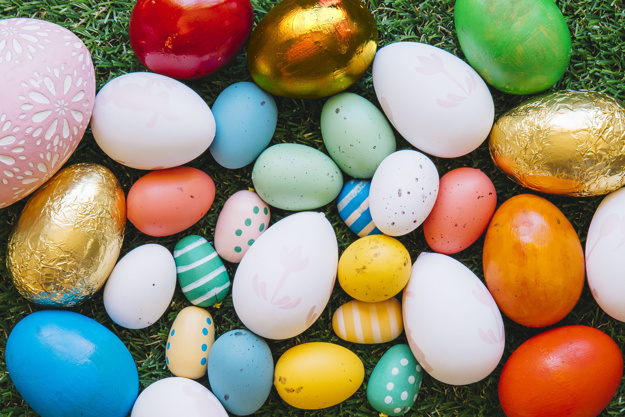 Dying Easter eggs is one of my favorite Easter traditions, but after the hunts are over... what do you do with those eggs? Egg Salad. It's a classic--- and with good reason! It's delicious! This is a staple in my home for quick vegetarian (not vegan) lunches! The simplest egg salad is just a combination of chopped hard boiled eggs, mayo, dill relish, salt and pepper, but add in some onion and chopped celery for a heartier salad. You can also search the web for healthier options that ditch the mayo and replace with yogurt or avocado too. Yum. Deviled Eggs. I could eat deviled eggs every single day. They are another great favorite, and really go well with just about any meal-- sandwiches, ham, whatever. Whip some up and eat with your meals until they're gone. I love a classic deviled egg with mayo, a little mustard and relish, topped with paprika, but there are many other variations as well--- again with avocado... or mixing in bacon, topping with shimp, adding some spice... lots of great options to try out. For Breakfast. A hard boiled egg is actually a really great source of protein and a great way to start the day... eat them as they are for a simple, healthy breakfast! In The Lunch Box. Whether it's in place of your meat, or as an additional side, pop them in yours or your child's lunchbox for an addition pack of protein! On Sandwiches. There are many different sandwich options you can add your sliced eggs onto--- keep it simple with some sliced eggs, tomato and spinach, or just give a you simple ham or chicken sandwich a little something extra! On A Salad. Again, being a great source of protein, eggs or the egg whites can be a great addition to top your salad... slice them, chop them, there's no right or wrong way to do it. Amp Up Your Tuna Salad. Boiled eggs can take your tuna salad to a whole new level of deliciousness! Make it as you normally would- tuna, mayo, dill relish, chopped onions, chopped celery, salt and pepper, and toss in the chopped eggs too. Yum! Serve on a sandwich or for a low carb option, make stuffed tomatoes! Delish! Potato Salad. Who doesn't love a good potato salad!? Mix one up to use up these hard boiled eggs and you can serve as a side or pack in lunches all through the week! Which of these ideas are you looking forward to using? Do you have a go to hard boiled egg recipe you love? Share in the comments below. These are all good ideas. My boys love deviled eggs.